They say you should never meet your heroes. It saves you from blemishing their memories or expectations that you have of them, leaving you quite disheartened. However, this hero is among the last of its kind. The final one of two Japanese 600cc supersport still sold around the world has made its official debut in India. 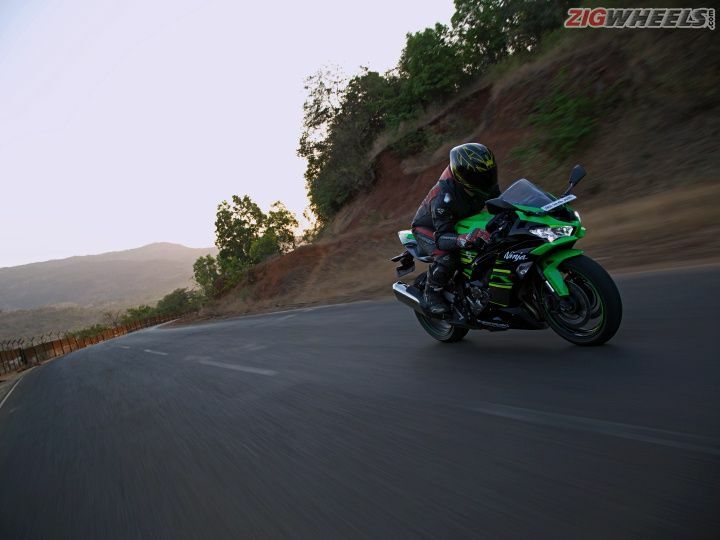 Yes, Kawasaki has brought the 2019 Ninja ZX-6R to India and let’s face it… it’s nothing short of a supersport hero. But we have questions. Is it a larger Ninja 400? Or is it a smaller Ninja ZX-10R? Is it practical enough to ride in Indian cities? Was it worth the wait? And was it a mistake to meet one of my heroes? I do not understand why people hate this design. The hate those two protruding winglets beneath the headlamps has garnered is shocking. Even most of the folks in the office are not in favour of them. I might be in the minority, but I do like the way it looks. To my mind this design began with the Ninja H2 and not as a Ctrl+C Ctrl+V job of the Ninja 400. The controversial front-end aside, the general form is still very pleasing to all. That tail is sleek as it should be and is at a sharper angle than the ZX-10R. Plus the proportions makes sure that it gives off a big bike vibe. Also, since it is a single seater, there is none of that clutter of Kawasaki India-developed grab-rails and BBQ-grille-worthy saree guard. Thank you Kawasaki India! Instead, you get a lovely cowl providing enough surface area to mount your GoPro for those MotoGP-esque shots. Those of us who have ridden their fair share of sportbikes will attest to the fact that their riding stance is fit for track hooning. Put it in any other environment and the rider will be left in a foul mood. An office commute will have you clutching your back and massaging your wrists. We are not saying that the Ninja ZX-6R will not do the same. But it is a little bit more easy going. It sure was fun blasting the motorcycle around the twisties but I was not complaining much on the ride back home. In that sense, it is a smaller ZX-10R. There is plenty of room to move about in the saddle, a big boon when you have got a belly like yours truly. Even though one sits just 5mm lower than the ZX-10R, the wide fuel tank reduces one’s ability to flat foot the bike. I was able to get the balls of my feet on the ground and I am 5ft 10in in height. But I’m sure someone a little shorter with slimmer thighs would find getting their feet down an easier feat. The pegs are very much rear-set and the low-slung clip-ons have a nice downward slope to them. One of the reasons why one opts for a supersport over a naked is the ability to mince corners. And if you live in the vicinity of Kari, MMRT or BIC, it should be a no brainer for you to have a track weapon. However, I stay 1200km away from the nearest circuit. I spend my weekends on the twisties surrounding Pune, primarily Lavasa. So does it still make sense for me to go for the ZX-6R for my weekend thrills? Yes, it does. Thanks to two key areas. Firstly, the engine. With 130PS (which goes up by a further 6PS thanks to Ram Air) and 70.8Nm on tap, it has just enough power to enthrall me. Given the inline-four architecture, a chunk of the power is made really high in the rev range. It spools up quickly as it gets to the beginning of the actual point of fun with a simple twist of the throttle. 6000rpm is where the fun begins and then it goes all the way up to 16,000rpm! It goes from nothing to ballistic in no time. 100kmph flashes on the dash in just 3.47s, with 160kmph in just double that time. But it is the tractability which surprised me. You need not keep the engine at the edge of insanity to keep the bike going. In fact, you could run it a cog higher into bends, especially uphill hairpins, and it still gives you enough drive for exits. It pulls away cleanly from speeds as low as 18kmph in sixth gear. This prompted us to test just how much she could do in top cog. Although this test is a bit unconventional, in 6th gear, the ZX-6R went from 30-190kmph in 15.31 seconds before running out of road. The way it goes through the gears widens the grin plastered on your face. Equipped with a quickshifter, upshifts are a breezy affair. Shame it does not come with an auto-blipper. Clutch operation is light with precise shifts guaranteed every single time. Each and every time you wring the throttle, you are welcomed by a hearty intake whirl followed by the classical howl of an inline-four. The electronic suite on the ZX-6R is very limited. Two power modes, three levels of traction control and an always active ABS system are the only rider aids it comes with. Ride-by-wire is sorely missed as on-off throttle transitions with the cable throttle feel a tad jerky. This is especially an issue when opening the gas coming out of a corner. There is a bit of unnecessary weight transfer that could force you to correct your corner approach. It isn’t a deal-breaker though, and is something that you can learn to live with. Secondly, and more importantly, what makes the ZX-6R a real delight is the mechanical bits. A sharp rake and an equally short wheelbase means it is relatively easy to tip it into corners.But, thanks to the fantastic aluminium perimeter frame and swingarm, you get a supremely communicative chassis setup that provides plenty of stability. Once leaned over, the motorcycle rarely steps out of line. Even with the TC wound down to the lowest setting, there’s just enough slip to allow you to slide a little bit. The soft Bridgestone Battlax Hypersport S22s are grippy for the most part. But this was Lavasa, where small undulations are aplenty and gravel is strewn through most sections. I am sure on a grippy track surface, outright traction wouldn’t be an issue. You can hook yourself on to the bike quite well with the touch points perfectly setup for riders of almost all heights. The shape of the tank even allows chunky riders to grip it with ease and the heel plates are just what the doctor ordered to lock your riding boots on to. Even while tucking in, there is a small depression in the tank which slim riders could use to rest the chin of their helmets on. Sadly, I need to lose a few inches before I can even think about resting my multiple chins. Over the past year, the condition of roads leading up to Lavasa have really taken a beating. Small depressions and potholes have arisen in most sections. Here’s where the top-spec components really prove their worth. The stock tuning of the fat Showa USDs was a bit on the softer side and served its purpose well on public twisties. However, those who venture out to race tracks should crank up the preload and compression. The stock settings of the rear suspension was left untouched as I had no intentions of tuning it for my weight. It soaked in those mid-corner Lavasa bumps in its stride. The braking units are not from a certain Italian manufacturer but rather from Nissin. The stopping power is fantastic and there’s a good amount of feedback. However, we guess the braking would have been leagues better had the ZX-6R been equipped with Brembo M50 monoblocs. These units are one of the primary reasons why the much-loved Triumph Street Triple RS has become a segment benchmark in this area. Another reason why the RS performs brilliantly is the ABS calibration. The Kawasaki Intelligent Braking System (Kawasaki’s ABS) feels a bit too intrusive. Better ABS calibration or a multi-level sensitivity setting for the safety aid is something which we would have liked to see. Part of the ownership experience of a sportbike is living with it. I spent two days of commuting on the ZX-6R (one of them in a single-piece leather suit) and it rarely felt too cumbersome. The low-speed tractability is phenomenal and it is nimble enough to flit between traffic. The soft suspension tuning allows you to float over potholes. And the slick quickshifter just simplifies the city riding experience. There are issues which might cause mild discomfort. Firstly, because the steering doesn’t turn much to either side, taking a U-turn needs to be planned to perfection. Otherwise you’re left trying to pull off a three-point turn like in a car. Next up is the heat. You will feel the heat around your ankles while riding it in peak rush hour traffic. It is more to do with the exhaust routing than the actual motor, which actually runs pretty cool for its size. Though not a deal breaker, it would necessitate you purchasing some quality ankle length riding boots. Your sneakers aren’t just going to cut it. Lastly, the LED headlamps provide good spread but we wish the low beam was brighter. The Kawasaki Ninja ZX-6R comes as a welcome surprise in the current world of sportbikes. It has enough to thrill an experienced rider and is capable of helping an intermediate rider get better without scaring him or her. Modern sophisticated electronics would have certainly enhanced the Ninja’s rideability, but the keyword here is ‘enhanced’. In its current setup, the ZX-6R rarely left us wanting. When you consider its price tag of Rs 10.49 lakh (ex-showroom India), it is not astronomical as you will have to spend a hell of a lot more to get a sportbike that is half as versatile and equally as enjoyable as this. Do you need any more reason to buy it?